(Nanowerk News) A team of researchers has demonstrated a new type of imaging system that reveals the chemical composition of living tissue for medical diagnostics and cellular studies. The development is potentially important because knowing the chemical content of tissue is needed for early detection of disease, and the system also can be used to study molecular dynamics in living cells as they are occurring, said Ji-Xin Cheng, a professor in Purdue's Weldon School of Biomedical Engineering and Department of Chemistry and Scientific Director of the Label-free Imaging lab at Purdue's Discovery Park. 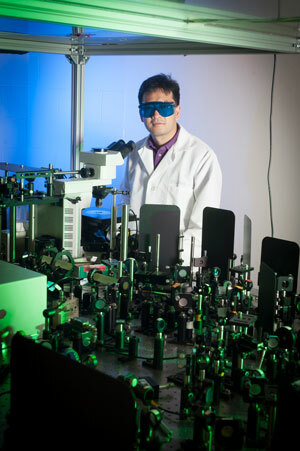 Ji-Xin Cheng leads a Purdue team demonstrating a new imaging technology developed with a $1 million W.M. Keck Foundation grant. The technology could bring advanced medical diagnostics. Conventional imaging technologies such as magnetic resonance imaging and computed tomography do not reveal the chemical composition of tissues, he said. Although optical spectroscopy has been routinely used to study molecules in a sample cell, it is currently not practical to perform in-vivo spectroscopy, or the analysis of how light interacts with molecules in living tissue. This is because photons strongly scatter when light shines through tissues, making detection of the signal through a spectrometer inefficient, Cheng said. "Our technique overcomes this problem," he said. Findings are detailed in a research paper appearing online on Friday (Oct. 30) in the journal Science Advances ("Spectrometer-free Vibrational Imaging by Retrieving Stimulated Raman Signal from Highly Scattered Photons"). The new technique works by "coding" individual photons from a pulsing laser with a megahertz radio frequency and then collecting those photons with a detector after they have interacted with tissue. The system was demonstrated in human breast cancer detection. Ordinarily, the cancer tissue samples would have to be processed for histological examination, which could take up to a week. The new technology yields results in about two seconds. The technique also was used to map vitamin E in the skin of laboratory mice. "People use vitamin E on their skin as a topical treatment, and, like any drug, we would like to know where it goes after it is applied to study drug delivery mechanisms," Cheng said. "We converted Raman spectroscopy, which is generally used to study molecules in solutions or fixed tissues, to an in-vivo imaging platform that is able to monitor how a living cell executes its functions in real time. It's a proof of concept. The approach allows us to get a spectrum of individual molecules, revealing the chemical composition of the tissues." The innovation offers "label-free" detection, or imaging that does not require the use of fluorescent dyes or other preparations to detect structures and features. Because processing kills the tissue and is time-consuming, the label-free technology allows the study of unaltered living tissues and cells, making for more rapid and accurate studies, Cheng said. The system was developed with a $1 million W.M. Keck Foundation grant to Cheng and his team. The Science Advances paper was authored by graduate student Chien-Sheng Liao, postdoctoral researchers Pu Wang and Ping Wang; graduate students Junjie Li and Hyeon Jeong Lee; instrumentation specialist Gregory Eakins; and Cheng. The work is ongoing, with future research exploring development of an "imaging pen" to quickly analyze surfaces for traces of explosives for homeland security applications and to monitor human tissue for disease and infection and to help surgeons determine whether any diseased tissue remains after cancer surgery, Cheng said.